This set of Electrical Machines Questions and Answers for Entrance exams focuses on “Efficiency of Synchronous Machines”. 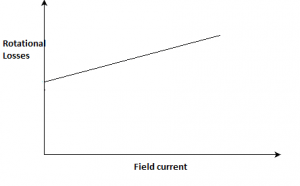 Explanation: Short circuit losses comprise of direct load loss and stray losses too. 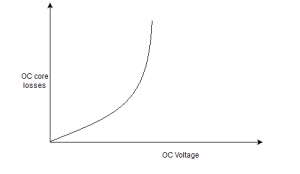 Explanation: Core losses vary as a square of the voltage. 3. 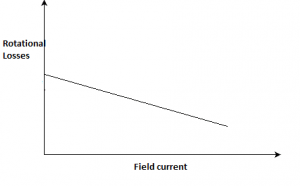 Rotational losses vary as following with respect to field current. Explanation: The y-intercept depicts the friction and windage losses. 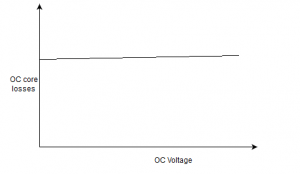 Explanation: Short circuit losses at full load = 3*(131.22)2*0.02 = 1033W. Efficiency = 1 – (2122/2122+80000) = 97.4%. 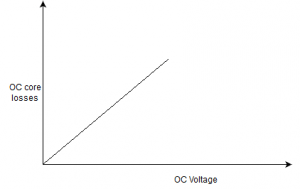 Explanation: I = P/1.73*V = 5000/1.73*11000 = 26.24 A. Explanation: ALl the statements are correct. Explanation: As the field is on the rotor, the field will be set up w.r.t. rotor. A. E.m.f. 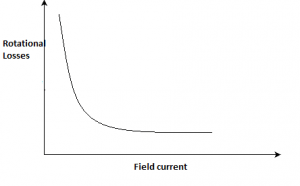 generated by armature reaction lags armature current by 90°. 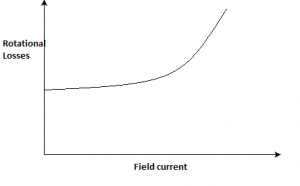 Explanation: Air gap voltage will lag the field flux by 90° to generate the emf. 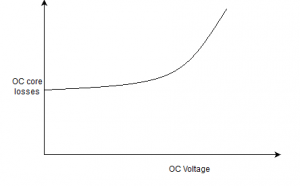 Explanation: Xs = magnetizing reactance + leakage reactance. 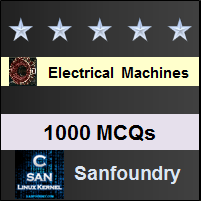 To practice all areas of Electrical Machines for Entrance exams, here is complete set of 1000+ Multiple Choice Questions and Answers.